WWII was in progress, which kept Lucienne from pursuing textile design for a few years, but as soon as the war was over, she became a freelance textile designer, mostly for dress fabrics. 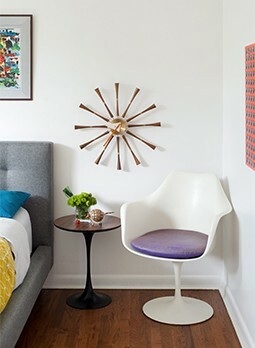 However, interior design was her passion, and as soon as she saw the opportunity to switch, she jumped on it. Her career took off at the 1951 Festival of Britain, where she displayed several of her designs—both fabrics and wallpapers—including the most famous design of her career, Calyx. 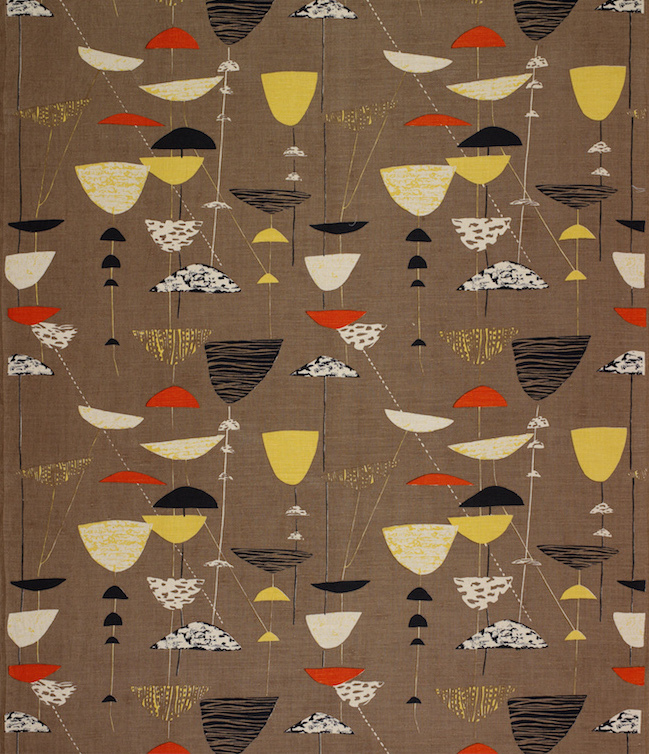 Printed on linen with abstract patterns in yellow, orange-red and olive, it was reminiscent of modernist artwork. The design went on to win several awards, including the Gold Medal at the Milan Triennale and the International Design Award of the American Institute of Decorators. While at the Festival of Britain, Heal Fabrics, a subsidiary of the London department store Heal & Son, saw the fabric and purchased it. The design was so successful that the company commissioned Lucienne to design six new fabrics each year, which she continued to do for the next 25 years. She produced over 70 fabrics for Heal, but also worked with other manufacturers such as Liberty’s and Edinburgh Weavers. While Lucienne is most famous for her fabrics, she wasn’t afraid to branch out. She also designed wallpaper, ceramics and carpets. In fact, her very first carpet design, Tesserae, won a Design Centre Award. Lucienne occasionally worked with her husband as a design consultant as well, and even helped design the interiors for several aircraft, including the VC10 and Super VC10. At the time, it was rare for a designer to work internationally, mainly due to the post-war tensions between countries. However, Lucienne managed to be successful in this area as well, and worked with German companies to distribute wallpapers and ceramics. 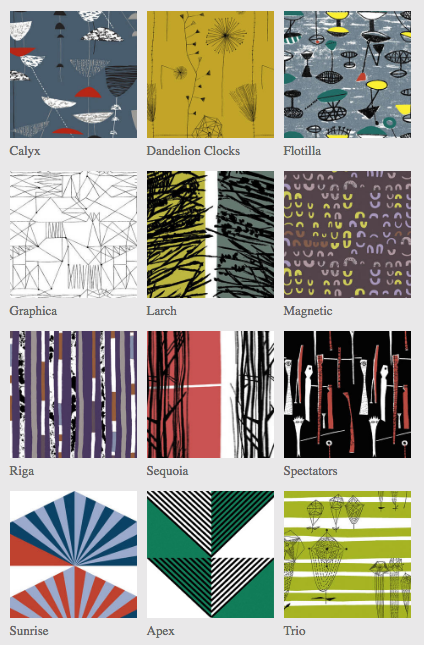 Lucienne chose these 12 designs to be reproduced by Classic Textiles, so you can now add them to your home! During her heyday of the 1950s and ’60s, Lucienne’s designs evolved with the changing design trends. The early 1950s saw energetic designs with doodle-like graphics and motifs with spindly leaves and stems. Some of her more famous designs from that time are Dandelion Clocks (1953) and Graphica (1953). By the late ’50s, her designs became more painterly, with larger scales. Designs from this period include Sequoia (1959) and Larch (1961). By the 1960s, flower power was trendy, and Lucienne incorporated brighter colors and florals into her fabrics. A few of these include High Noon (1965), Poinsettia (1966) and Causeway (1968). By 1975, many of Lucienne’s close contacts had retired, so she withdrew from mass-produced design. 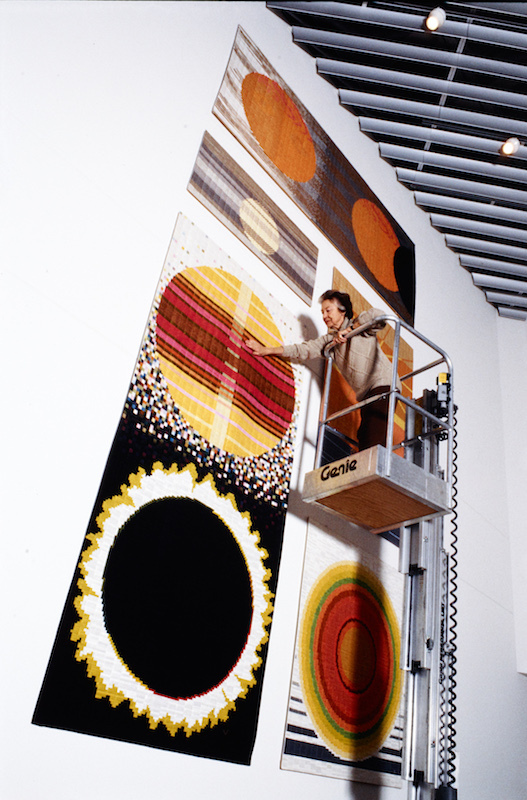 Instead, she created silk mosaic wall hangings, which were exhibited at museums and theaters in the 1980s and ’90s. But her fabric legacy has continued. Shortly before her death, Lucienne selected 12 of her designs (above collage image) to be reproduced through Classic Textiles, which you can now order on a cotton or linen fabric. 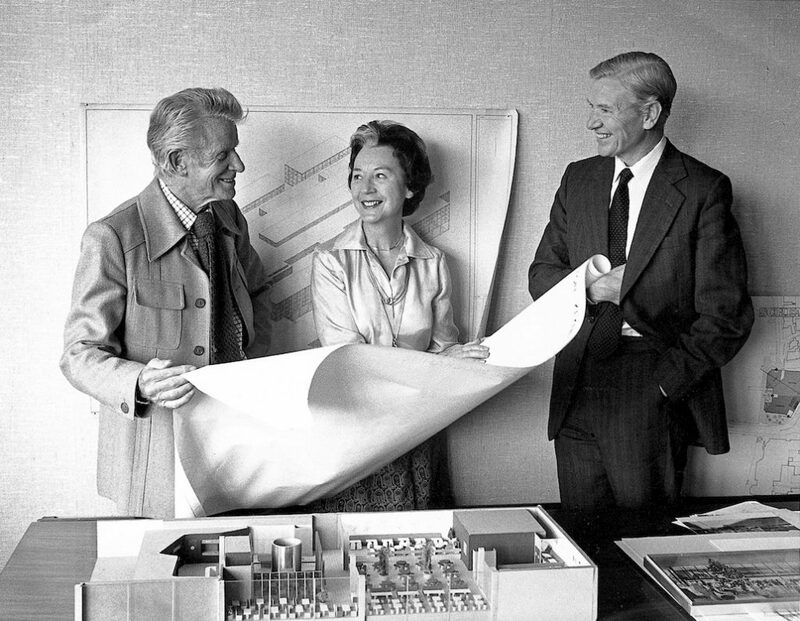 That way, you can help Lucienne’s legacy continue to live on in modernist homes.